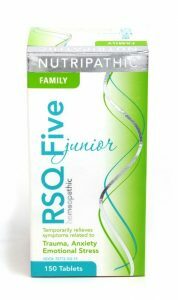 BOCA RATON, Fla. — Private Label Brands’ Nutripathic line of homeopathic remedies offers RSQ Five Junior. This product provides temporary relief from trauma, anxiety, and emotional stress; and can be used by the whole family with adults just doubling the dosage. RSQ Five Junior is a combination of homeopathic and flower essence remedies. The brand adheres strictly to the safety and efficacy of the ingredients and of clean labeling. Additionally, these tablets have a nature identical berry flavoring with no added sugar, making them tasty for all ages. Anxiety is a normal part of life for adults as well as children. Many children go through anxious phases, whether sparked by a traumatic event or even watching a scary movie. Regardless of the cause, no parent wants to see their child dealing with fear, shyness, or insomnia even for a limited time. RSQ Five Junior is able to naturally aid in these symptoms and provide temporary relief, as well as peace of mind for parents. The tablets are also pet friendly. “The feedback we’ve received from parents in reference to our RSQ Five Junior product is overwhelming. It fills me with joy to know we’ve been able to make a difference in so many lives,” van Zyl said. Lauren van Zyl and Michele de Beer are the founders of Private Label Brands, each have more than 20 years of experience in the industry. The Nutripathic brand was designed specifically for the U.S. market, using FDA-approved packaging.